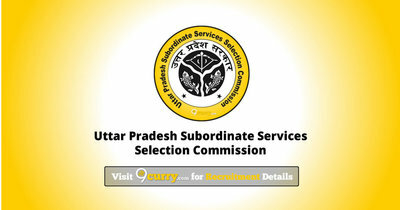 UPSSSC Recruitment 2019 - Below are various recruitment notifications published by Uttar Pradesh Subordinate Services Selection Commission, Lucknow / upsssc.gov.in. As of now, we don't have any active recruitment notification by UPSSSC featured here. We may update as soon as the organization announces a new job notification. If you are looking for any information related to previously organized recruitment drives by UPSSSC, you can browse through previous job notifications mentioned below and get the new updates or information you are looking for. UPSSSC Recruitment 2019 - Apply Online for 1364 Lekhpal Posts in Uttar Pradesh on Permanent Basis. Online Applications are invited by Uttar Pradesh Subordinate Services Selection Commission, Lucknow from 06 Mar 2019 to 05 Apr 2019 for 1,364 vacancies. UPSSSC Recruitment 2019 - Apply Online for 420 Homeopathic Pharmacist Posts in Uttar Pradesh. Online Applications are invited by Uttar Pradesh Subordinate Services Selection Commission, Lucknow from 25 Feb 2019 to 18 Mar 2019 for 420 vacancies. UPSSSC Recruitment 2019 - Apply Online for 672 Chakbandi Adhikari & Other Posts in Uttar Pradesh. Online Applications are invited by Uttar Pradesh Subordinate Services Selection Commission, Lucknow from 30 Jan 2019 to 19 Feb 2019 for 672 vacancies. UPSSSC Recruitment 2018 - Apply Online for 16 Roller Driver, Manchitrak Posts in Uttar Pradesh. Online Applications are invited by Uttar Pradesh Subordinate Services Selection Commission, Lucknow from 28 Dec 2018 to 12 Jan 2019 for 16 vacancies. UPSSSC Recruitment 2018 - Apply Online for 284 Mandi Inspector Amin, Junior Assistant & Other Posts in UPSSSC, Uttar Pradesh. Online Applications are invited by Uttar Pradesh Subordinate Services Selection Commission, Lucknow from 05 Dec 2018 to 26 Dec 2018 for 284 vacancies. UPSSSC Recruitment 2018 - Apply Online for 1477 Sub Engineer, Computer & Other Posts in Uttar Pradesh. Online Applications are invited by Uttar Pradesh Subordinate Services Selection Commission, Lucknow from 30 Oct 2018 to 30 Nov 2018 for 1477 vacancies. UPSSSC Recruitment 2018 - Apply Online for 2059 Agriculture Service Technical Assistant III Posts in UPSSSC, Lucknow, Uttar Pradesh. Online Applications are invited by Uttar Pradesh Subordinate Services Selection Commission, Lucknow from 21 Jul 2018 to 23 Aug 2018 for 2059 vacancies. UPSSSC Recruitment 2018 - Apply Online for 1953 Gram Panchayat Adhikari, VDO & Social Welfare Supervisor Posts in Uttar Pradesh on Permanent Basis. Online Applications are invited by Uttar Pradesh Subordinate Services Selection Commission, Lucknow from 30 May 2018 to 25 Jun 2018 for 1953 vacancies. UPSSSC Recruitment 2018 - Apply Online for 694 Excercise Trainer, Vikas Dal Adhikari Posts in UPSSSC, Uttar Pradesh. Online Applications are invited by Uttar Pradesh Subordinate Services Selection Commission, Lucknow from 13 Mar 2018 to 17 Apr 2018 for 694 vacancies.